We would like to introduce ourselves one of leading importer and supplier of multimat , multimat is an antimicrobial mat , which is used in i. C. U/operation theater, emergency room and patient ward. - Sizes available: 24" x 36"
- Sizes available: 24" x 36" & 26" x 45" . - Layers: 30 layers/mat with numbered corner taps for easy monitoring of usage. 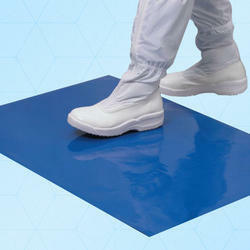 Sticky mat ensures effective partical control& process in a clean room environment. PP Rectangle Sticky Mat, Mat Size: 24"x36"
Size: 24" x 36" , 26" x 45" , 36" x 36" etc. Blue Sticky Mats, Mat Size: 24 X 36 "
Mat Size: 24 x 36 "